KC Properties is pleased to present you this solid comfortable house which is located in an ecologically clean village, 20 km from the sea and Kavarna town. Total living area of the house is 120 sq.m. and comprise of: Ground floor – 70 sq.m. - office, living room, kitchen, bedroom and large bathroom; Upper floor - attic (50 sq.m.) - one bedroom with a balcony. It is suitable for summer use with air conditioning. There is a toilet and a washbasin The entrance to the second floor is via an internal staircase and also from the outside from the balcony The house can be used all year round. It has outside insulation (5 cm thick) of the walls. Heating is provided by a stove - fireplace, plus infrared, economical panels in each room The plot of land is 3600 m2 and is planted with different fruit trees: Cherry, apple, plum, pear; shrubs - raspberry, blackberry, strawberry and many flowers. There is a large garage, a woodshed and a summer kitchen with a fridge, a plate of water and sewer The house has a 300 l water collector On the plot there are old buildings for animals, which can be redesigned into residential premises or a guest house, as included in the plot plan The house is offered for sale with all the furniture, appliances, garden tools, lawn mower, and tools for maintenance. This is a newly built luxuriously finished three bedroom house situated in a lovely village 9 miles to the seacoast and town of Balchik. The house has a spacious living area of 140 sq.m. spread over 2 floors comprising of:large living-room + diner + kitchen (fully equipped with electric appliances) a bathroom and 2 bedrooms on the ground level. The upper floor consists of one bedroom with own toilet, spacious living-room and 2 balconies. Beautiful views reveal from the upper floor towards the garden and surroundings. There is a storage room 14 sq.m. suitable for keeping garden tools. Plot size - 1250 sq.m. with a swimming-pool and a parking lot. The property is finished to an excellent contemporary specifications including PVC double glazed windows, ceramic tiled floorings throughout, heat and sound insulation of the walls and roof. The property is for sale inclusive of all the furniture and electric appliances - 2 refrigerators (one is integrated in the kitchen; the second one is \"Side-by-side\"), dish-washer, cooker with ceramic hobs, washing machine, modern leather sofa, fully furnished bedrooms, modern bathrooms. The house is heated with wood-burner (fire-place type) on the ground floor and an air-condition on the second floor. The house has a security system. Internet and a telephone could be installed upon request.The garden has micro-drip-irrigation-system (the equipment is also included in the price). Excellent opportunity for living all year round or for renting out! Family house with 7 Bedrooms and 3 bathrooms, 10 min. drive to the Beach. Charming House with 2 bedrooms near Balchik and the sea. New built 4 bedrooms house, 3 km from the Sea. Dobrich. New built 4 bedrooms house, 3 km from the Sea For sale is a New built house with 220 sq. m. of living area set on a plot of 420 sq. m. of land. The village is ideal for relocation or holidays – there are several shops, police station, pubs, restaurants, post office, etc. The nearest big town Balchik is less than 5 min drive away and has everything that a town could offer – banks, shops, restaurants, bars, supermarkets, Lidl, bakeries, open market, small yacht port, etc. There are 3 Golf Courses nearby and many places with lovely beaches. The nearest Airport is in Varna, which is about 40 min drive by car. The house is two storied and consist of: The ground floor of the house comprises of a bright and spacious lounge with dining and kitchen area; 1 bedroom with French windows, bathroom with toilet and a hallway. The living room has French windows and doors leading to big veranda with BBQ area. The second floor has 3 Bedrooms with balconies and bathroom with toilet. Coming on a very reasonable price and in such a beautiful and convenient location, the property would be ideal for those looking for permanent relocation, a holiday home or an investment. The property is: - 3 km from the nearest Beach; - 5 km from the three Golf Playgrounds; - 10 km from the sea town of Balchik; - 12 km from the Beautiful beach Bolata; - 50 km from Varna Airport and the seacoast. Newly built 3-bed house with a pool in Avren, very close to Varna. 1 Double bedroom 1st Floor Apartment located in Kranevo, 100 yards from the Beach and all its great bars Restaurants and Water Sports, just less than 0.6 miles from Black Sea Ice Arena, Sun and Love apartments provides accommodation with a seasonal outdoor swimming pool, a fitness center, a bar, and WiFi. This property offers access to ping-pong! This air-conditioned 1-bedroom apartment comes with a seating area, a TV and a kitchenette. The apartment offers sun terraces off the living area and bedroom and is fully furnished. For investors, this apartment has been successfully rented out fully for the past 3 years The nearest airport is Varna Airport, 23.6 miles [20mins] from the property. This property also has one of the best-rated locations in Kranevo! Guests are happier about it compared to other properties in the area. This property is also rated for the best value in Kranevo! Guests are getting more for their money when compared to other properties in this city. Superb location for visits to Varna City, Albena, Golden Sands andamp; Balchik all in easy driving distance. RESORTS Closest landmarks Aqua Park Albena 1.8 miles Aquapolis Golden Sands 4.4 miles Aladzha Monastery 5 miles The Palace of Queen Maria 6.1 miles Argisht Lift 6.3 miles About the beautiful village of Kranevo! The village of Kranevo is a climate treatment sea settlement. It is located at a distance of 2 km from the resort of Albena, which can also be reached on foot along the seashore stripe. The beaches consist of light sand, and they are maintained and clean. The sea is shallow and allows safe swimming for children. In the south part of the village, there are remains of an ancient civilization and a National Children Complex is constructed. The population is about 1,000 residents. There are autobus connections with Balchik, Kavarna, Dobrich, and Varna. The northeast branches of the Frangensko Plateau reach Kranevo from the south and the southwest. The Kranevska River flows near the settlement. The climate is sea-based, with some continental influence (average annual temperatures of 12anddeg; С, average annual rainfalls of about 460 mm), sunny and hot summer, humid and warm autumn. The beach stripe is vast, with light sand, a small inclination of the by-shore sea bottom. In the southern part of the beach, preserved by a high slope of the plateau, there is a National Children Complex. To the north of Kranevo, in the valley of Batova river, there is a dense forest, black soils, and lime rocks in some places. Vine-growing, fruit-growing and vegetable growing are developed in the region. The settlement offers a large number of hotels, holiday stations, villas, and apartments. The house has a total living area of 78 sq.m and comprises of: - 2 bedrooms – one is with a closet; - Kitchen; - Bathroom/WC; - Hallway. The house is finished to an excellent standard and is ready to move in. There are wooden laminated floors, PVC double glazed windows, fitted kitchen, fully tiled bathroom. The heating is provided by wood burner. The house is warm and cozy and is suitable for living 4 seasons. There is a gazebo which is perfect place for having a drink during the warm summer days. The plot size is 860 sq.m. with a vine-yardand water-well. Another benefit is the lovely open far reaching views towards the surroundings. The property offers perfect combination of beautiful nature, peacefulness and comfort. Location: The property is situated in a quiet village which is equal distance to towns Dobrich and General Toshevo. The village offers food shops and regular bus transport. Distance to Dobrich is 15 km, to General Toshevo – 10 km. Balchik town and the sea coast is 35 km away. Furnished house with a swimming pool on the outskirts of Varna. Furnished house with a swimming pool on the outskirts of Varna Size of the house: 165 sq.m. Size of the garden: 615 sq.m. The property consists of a lovely 2-storey house, built in 2010 in Mediterranean style. It offers accommodation of 165 sq.m., and comes for sale with a plot of land spreading over 615 sq.m., and a swimming pool. The house was built on 4 levels and each room is set on a different level, connected to each other with 3 staircases. It consists of a living room with kitchen area /33 sq.m. total area/, 2 bedrooms /each by 18 sq.m./, office room /13 sq.m./, 3 bathrooms, wet room, storage room and a corridor. The garden is well maintained and landscaped, decorated with flowers, fruit trees, vines and rockery. It is supplied with an automatic water system and drip irrigation system for vegetables. The size of the pool is 7.5 m x 3.5 m. A garage is also available. The house is offered for sale fully furnished and equipped with appliances. The village is very nice and well developed located less than 5 km from the sandy beaches of Kranevo and Albena Resort, 20 km from the centre of Varna City and 29 km from Varna International Airport. It is supplied with grocery stores, pub, medical service, mayor’s office, post office and a regular bus transport connects it with Varna and the beaches. Price: 165.000 Euros Payment plan: 100% cash. Renovated bungalow, ready to be lived in, 17 km from Varna and the beach. This Studio Apartment is situated on the third floor of Harmony Hills Complex with a South-West aspect. Harmony Hills is one of the most elegant apartment and villa developments in Bulgaria. The complex is located in the charming village of village of Rogachevo, about 38 km to the north of Varna City, and just 35 km from the Airport. It is not far from the commercial area at the centre of the village, but away from all the noise and the traffic. This third-floor apartment for sale has 37.86 sq. m. of living space and is fully furnished, with a dishwasher, washing machine, tables, chairs and more. It is in a very good condition and has had only a few occupancies. So it is still as good as new. This studio apartment is large enough to fit a sitting room, a dining area, a well-equipped kitchen, one bedroom and a modern bathroom. A family of four can reside in this apartment comfortably. Also, the apartment offers a great view and overlooks the pool and the vineyard. About the Village of Rogachevo Rogachevo is a charming little village which is both traditional and modern, with access to all essential modern amenities such as fast internet broadband, public transport, shops, boutiques, restaurants, bars and more. Harmony Hills is at the heart of Rogachevo, at a short distance from the village centre and borders the natural reserves and hunting areas. It is at a 5-minute drive from three professional golf courses and at a distance of 4 km from the beach. Whatandrsquo;s more, there is a daily shuttle bus that takes you from the complex to the beach, whenever you want to go. About the Facilities Available at Harmony Hills Harmony Hills is one of the best designed apartment complexes you will find on the Black Sea Coast. It is clear that a lot of thought has gone into the development of this magnificent complex. The facilities available here include... Reception and 24 Hour Security An Adultandrsquo;s Swimming Pool and a Terrace with Umbrellas and Sun Loungers A Children's Swimming Pool andamp; Play Area Fitness Studio andamp; Wellness Centre Clubhouse Restaurant Professionally Maintained Landscaped Gardens and Other Common Areas Laundry Rooms Well Managed Leisure Areas This apartment is available for purchase right now and for a great price at that. It is a well furnished, well managed studio apartment which matches the standard expected from an international rental. 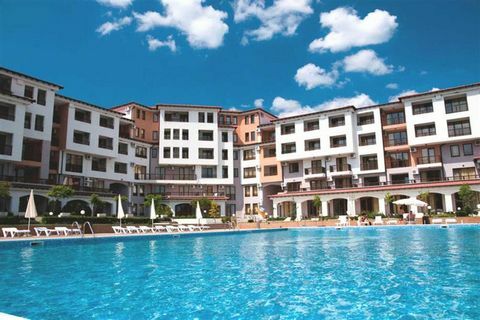 Whatandrsquo;s more andndash; it makes for a perfect investment opportunity if you want to buy property in Bulgaria. Superb Studio Apartment in Rogachevo Bulgaria. Superb Studio Apartment in Rogachevo Bulgaria Euroresales Property ID – 9824908 Property information: This is a superb studio apartment which is located in Rogachevo, Bulgaria. The property is situated on the fourth floor and has a nice view from the balcony which overlooks the pool area and the beautiful Bulgarian countryside. The property also includes a superb communal pool which provides a nice area to cool down on hot sunny days. Along with the pool there is also a access to a bar and restaurant. The parking included with the property is off-street parking. The property comes fully furnished throughout, common room with queen bed, sofa bed, kitchen, cable tv, air conditioning and separate shower room. Rogachevo has a temperate-continental climate with moderate features which is characteristic for Central Europe, with hot summers, long, cold winters and very distinct seasons. Abundant snowfalls may occur throughout the country from December to mid-March, especially if you are in the mountainous areas. About the area: Rogachevo is a village in Balchik Municipality, Dobrich Province, Northeastern Bulgaria. Balchik Municipality is a municipality in Dobrich Province, Northeastern Bulgaria, located on the Northern Bulgarian Black Sea Coast in Southern Dobruja geographical region. It is named after its administrative centre - the town of Balchik. The municipality embraces a territory of 523 km² with a population of 21,832 inhabitants, as of December 2009. The area is best known with the Balchik Palace complex in the main town as well as the luxury seaside resort of Albena. The main road E87 crosses the municipality connecting the port of Varna with the Romanian port of Konstanza. Luxury house with 2 bedrooms, 2 bathrooms, 5 min to the sea. Varna. Luxury house with 2 bedrooms, 2 bathrooms, 5 min to the sea IBG Real Estates brings to your attention this beautifully furnished two-storied house located in big and well organized village. Just a 5 minute’s drive (about 4 km) from the Beautiful and sandy beach Romantica, the place offers an excellent opportunity for a break away from the hustle and bustle of the big resort. With its panoramic view of the seashore and the coolness of the forest, this village combines all that is necessary for complete relaxation or permanent living. The property has a key location, away from the noisy city environment and at the same time is at a close distance 25 km. from the big city Varna and the international airport. The two-storied house is for sale stylishly furnished and it has total living area of 166 sq.m. and a private garden with size of 1000 sq.m . The house consist of : Ground floor: Spacious living room, fully equipped modern kitchen with dining area,a corridor and stairs to the first floor. There is a veranda with sea view. First floor: two big and spacious Bedrooms with balconies with sea view, Large bathroom with bath, toilet and sink and Second bathroom with shower. The property comes with a large plot of land with size of 1000 sq. m., split into sections – one is in front of the house, beautifully arranged BBQ area, paved patio area, private garden and park space. This is a great value for money property, for sale fully furnished and equipped and ready to accommodate its new owners. Distances: - 4 km from the Sandy beaches; - 20 km from the centre of Varna; - 25 km from Varna International Airport. New built House with 2 bedrooms near Balchik and the sea. 2-Bedroom house with 2600 sq.m. yard for sale near Kavarna and the sea. Dobrich. 2-Bedroom house with 2600 sq.m. yard for sale near Kavarna and the sea We are pleased to offer this well maintained property, located in a small village near the town of Kavarna . The village is located only 15-20 min drive from various beaches . The nearest one is in Kavarna. Kavarna is a nice town with fantastic restaurants, banks, shops, trade centre, schools, supermarkets, hotels, etc. Three of the finest Golf courses in Europe are within 20 minutes’ drive from the property. The best mussel farm in Bulgaria is right next to Kavarna and at about the same distance. Another landmark in the area is Cape Kaliarka , situated at 12 km from the town of Kavarna - a favorite stop for tourists. The property is set on a large plot of land with size of 2600 sq.m. with outbuildings and vineyard . The house is single storied and offers an entrance hall, two bedrooms, living room, separate kitchen and dining area. The house is in very good condition, but it needs adding internal bathroom, which could be added next to the kitchen. There is a big garage and storage rooms, which are attached to the house. Distances : - 18 km from the town of Kavarna and the sea - 20 km from the beaches in Krapets village - 25 km from the wide and long beach in Shabla - 35 km from the sea town of Balchik - 45 km from the town of Dobrich - 75 km from the city of Varna and the International Airport. KC Properties would like to present you this real estate property which consists of: Main house with 2 entrances which offers: kitchen, 3 bedrooms, wet-room and toilet; sitting-room with a separate entrance and a basement underneath; BBQ area. The main house is in livable condition and has new PVC windows. Enclosed garden with a garage and shed; The second house also has 2 entrances and comprises of kitchen, 2 bedrooms, living-room, wet-room, cellar and storage room. The house is solid, made of red bricks but needs some repair and improvement works. It has own enclosed garden and a garage. The houses are separated by solid concrete fence and both of them have access to the street. This makes them fully detached , with separate entrances and therefore suitable for using by 2 families. It is also possible one of the houses to rented out or used as house for guests/friends. The plot size is 1000 sq.m. Location: The property is situated in a well developed, live village within 15 km to Dobrich main city, accessed over excellent road. The village offers: food shops, caf?-bar, school and kindergarten, medical service, regular bus transport. KC Properties is pleased to offer you this exceptional property situated near Dobrich city and within 50 km the sea coast (Albena resort and Balchik). The property is set on a Regulated plot of 1520 sq. m. and offers: - 2 storey house which comprises of: entrance hall, a corridor, a kitchen and office downstairs two bedrooms, a corridor, a bathroom and a toilet upstairs. There are two covered terraces. The house has been renovated with replaced electric installation, external and internal insulation, 5 chamber PVC joinery. To the north side of the house there is an extension of 40 sq. M., As part of 20 sq. M. Is a garage with automatic door and 20 sq. M. An outlet for an emergency power supply (unit) has been made. In the yard are also located: - conservatory with area of ? ?24 sq. m, external and internal insulation, bathroom and toilet; - garden house is 12 sq. m. suitable for storage of garden equipment; - barbecue area of ? ?20 sq. m, sink and mini bar; - a 5x3x1,20 meters deep water pool and a water purification system; - a lake with water lilies. A 14-meter-long stream flows into the lake. The water rotates with a pump; - Garden lighting throughout the yard; -garden tent; - hydrophore system feeding all points in the property; - built underground water installation for watering comfort; - flower beds and lawns; - active lightning protection within a radius of 45 meters. There is a planning permission for extension of the main house with a size of 150 sq.m. The property is suitable for using as B & B or a quest house. 3 BED 2 BATH house near Gen. Toshevo. 2-Bedroom House with guest house near Balchik and the beach. 2 bedroom house with 7900 sq.m land near Kavarna and the beach. Renovated 2 bedroom house with big plot of land, 30 mins drive to Balchik and the Beach.